A proposal to pay out the entire 2018 net profit of Arla Group has been prepared by Arla's Board of Directors due to the positive development of Arla Foods’ balance sheet. The Board also recognizes that many Arla farmers are facing a tough financial situation due to this summer’s drought in Europe, and that it is in Arla’s best interest for this year’s net profit to be paid out to the farmers. Arla's Board of Directors (BoD) has discussed and agreed on a proposal for the company's supreme governing body, the Board of Representatives (BoR), to pay out the entire net profit from 2018 when the annual results are approved early next year, thus making a one year only deviation from the company's usual profit appropriation policy. "As a farmer-owned dairy company, we care deeply about the livelihood of our farmers and we recognize that this summer’s drought in Europe has been extraordinary. We are proposing that extraordinary measures be taken in this situation, and the Board is satisfied with the positive development of the company's balance sheet, which makes this proposal possible." says Chairman of Arla Foods, Jan Toft Nørgaard. The proposal will be discussed at the next BoR meeting in October. Based on this discussion, the Board expects to bring the proposal forward for a final decision at the meeting in February 2019 when the annual results are approved. The amount of this payout remains subject to there being no material changes to the profit level or financial outlook at the end of the year. If approved, the extraordinary payment will follow the regular timing of the supplementary payment in Arla, with money being paid out in March 2019. Also included in the BoD's proposal is the pre-requisite of a clear commitment to return to the company's existing retainment policy for the remainder of the current strategic period, affecting the financial years of 2019 and 2020. "Our balance sheet has improved significantly over the last few years, and the strength of our balance sheet makes room for this extraordinary initiative while still maintaining our investment plans for the continued future growth of the company. If the Board's proposal is approved, our financial ratios are expected to remain within the target range, provided there is a firm commitment by the BoR to return to the agreed retainment policy after 2018," says CEO of Arla Foods, Peder Tuborgh. For 2018, Arla expects net profit to be within the target range of 2.8 - 3.2 per cent of Group revenue. For more information on profit appropriation, see below. Arla Foods is a cooperative owned by dairy farmers in the UK, Denmark, Sweden, Germany, Belgium, Luxembourg and the Netherlands. All these countries were affected by this summer's drought in Europe. As a cooperative, Arla targets a net profit within the target range of 2.8 - 3.2 per cent of Group revenue, and the company pays out any additional profit throughout the year via the milk price to its farmers. At the end of each financial year, the Board of Directors propose how to appropriate the net profit (how much should be paid out as supplementary payment to farmers and how much should be retained for consolidation in the company). Ultimately, the Board of Representatives then makes a decision on the appropriation of net profit at its meeting to approve the annual results in February. Arla’s Board of Representatives consists of 175 farmer representatives from Denmark, Sweden, UK, Germany, Belgium, Netherlands and Luxembourg along with 12 employee representatives. Arla Foods is a global dairy company and co-operative owned by 11,200 dairy farmers with circa 2,400 of whom are British. Dating back to 1881, Arla’s purpose is to secure the highest value for its farmers’ milk, while creating opportunities for their growth. With production facilities in 11 countries and sales offices in a further 30, Arla is the world’s fifth largest dairy company and largest supplier of organic dairy products. Arla has a total of more than 18,000 colleagues and its products are sold under the well-known brands Arla®, Lurpak® and Castello® in more than 100 countries. 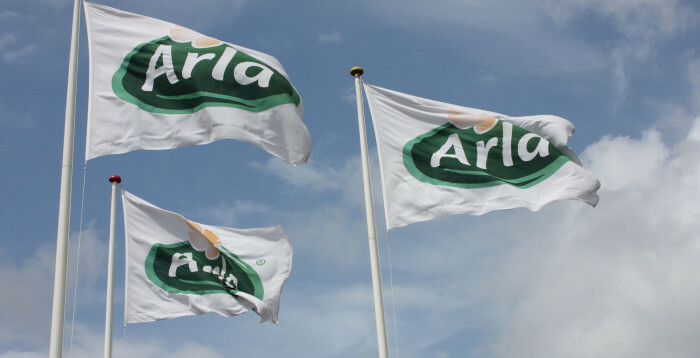 Arla Foods UK is the largest dairy company in the country and is home to leading dairy brands Anchor®, Arla Cravendale®, and Arla Lactofree® with a turnover of €2.21 billion. The UK is largest market within the Europe Zone, contributing 35% of the zone’s turnover and also comprises 25% of the Group revenue. As well as being a leading supplier of fresh milk, number one in butter, spreads and cream, Arla is the UK’s largest cheese manufacturer. It has also built the world’s largest fresh milk facility located at Aylesbury that later this year will become the first net zero carbon site of its kind. The UK business has a team of approximately 3,500 colleagues located at its dairies, creameries, distribution centres and head office.